This deck focuses on creating a bunch of tokens (potentially gaining a bunch of life), and using those tokens to sacrifice them, or to convoke to pull out some other big creatures. Essentially, you’ll start putting down some Llanowar Elves or Elvish Mystic , which help you start paying for the next stuff you'll want to put down next like Bitterblossom , Creakwood Liege , Nissa, Voice of Zendikar , Dark Salvation , and maybe a Parallel Lives . The Essence Warden is in there to give you life to offset the life cost of putting down Bitterblossom . Now you'll start sacrificing the tokens to put down some card: Demon of Catastrophes . The token army would also help you put down Torgaar, Famine Incarnate as well, which is really great if you can get him out early on. 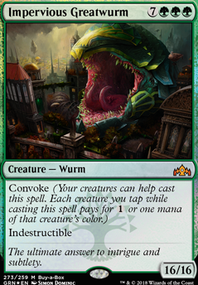 Finally, you can use your token army to convoke and pull out Impervious Greatwurm . Your tokens can also help you turn Westvale Abbey into a powerful demon.